Review Based On Use With iPads 1,2,3.
oscillators, filters, envelopes etc in front of me and I’m comfy, but C codes? 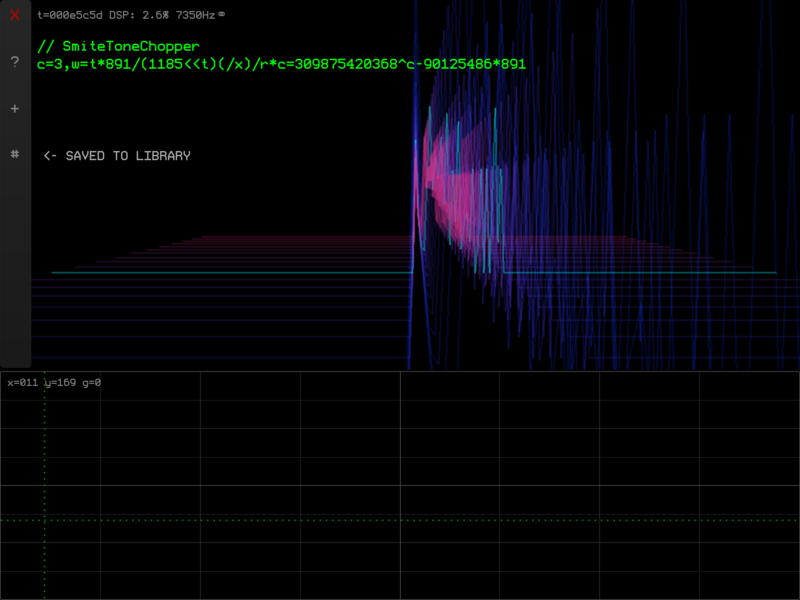 world of generative musical wonders. orchestrating a new epic cave adventure sound track. your MIDI keyboard, you can. 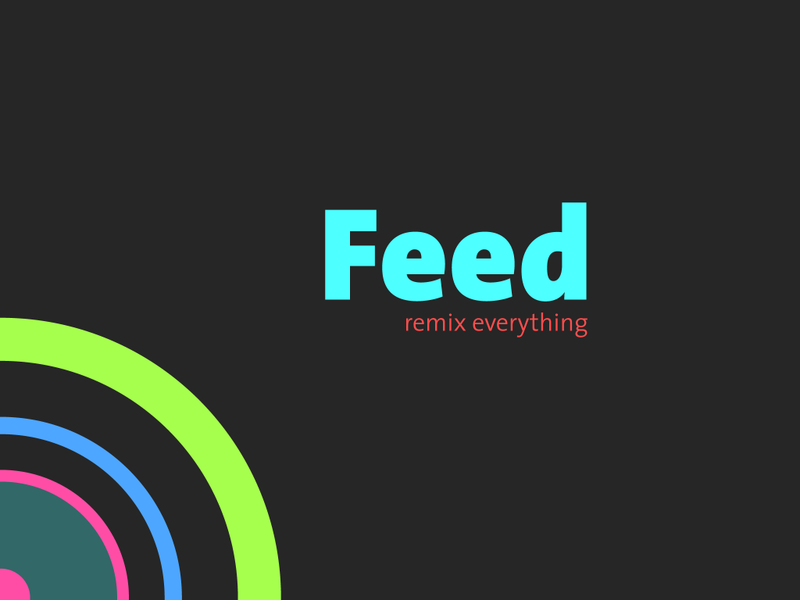 be uploaded to SoundCloud, emailed, or even Tweeted. recommending BitWiz. Check it out. Why Audio Copy? Because The Trees Don’t Have Outlets. I hear from people all around the world fascinated with the iOS way of making music anywhere they like. Being able to make music anywhere is a big and appealing factor. Not having to pack any computers, keyboards, or the wires to connect them is a compelling experience. The devices are only part of the experience, it’s the music apps that make it or break it. Thankfully most developers understand how important it is to function without the need of any other gear or cables. Anywhere. One thing I’ve seen in common with iOS music enthusiasts is they love to be able to make music where ever they want to. Perform a gig, record in a studio, or my favorite, go to a secluded park. It’s all under the mobility umbrella. Being mobile and able to complete a project where ever you want is not without it’s basic requirements. One critical requirement is being able to record a melody or whatever, and easily move it from one application to another. At home or on stage this is very easy thanks to access to our daily technological connections. 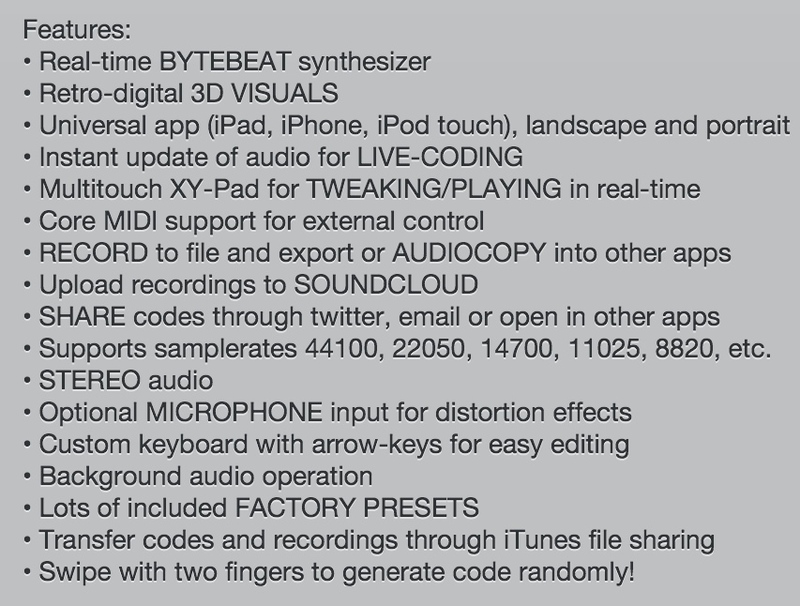 Just plug in, turn on MIDI, swap files over WiFi, or File Share. No problem. When away from all the comforts of home or stage this is a different story. Without any of those other aids, wires, and connectivity how does one record and swap files all on a single device? The band aid to the dilemma has been Audio Copy Paste. It’s far from perfect, is not the best solution, but it is the only option when in a secluded park, forest or on a mountain trail. Audio Copy allows the user to fully experience being mobile, and not needing any other devices, Internet connections, or wires. I’m not talking about 10 minute recordings, that’s nuts. I’m talking about brief recordings mostly under one minute, often much less. In these scenarios audio copy becomes more important, and in my opinion a requirement. Let me be clear, I do not love audio copy, I accept it. When I am away making music I don’t have any other technology access at all beyond my iPad and apps. It all must work wherever I go. 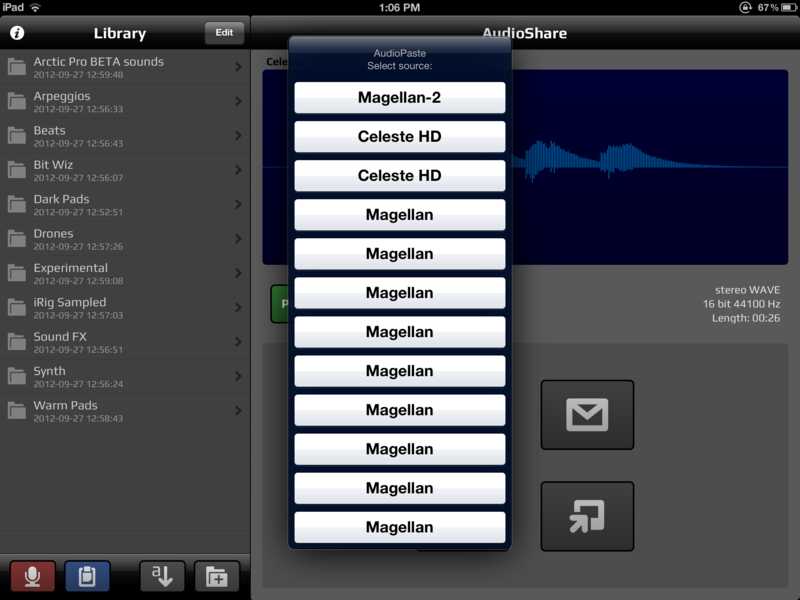 Audio Copy as flawed as it may be, serves a purpose and up to now has been the only truly mobile file sharing option. As I am writing this I’m checking Twitter, and saw a comment about how well apps without audio copy are mobile and work very well on stage. That’s partially true, but a painfully narrow view of mobility. It neglects the point of choice and freedom. I suppose if going to another place with all the abundance of technological comforts was all one ever does, than sure. No problem, you’re mobile-ish. Is that really mobile though? What if you have a broader definition of mobile freedom? Then what? Well, your only choice is Audio Copy if you want to swap files. Not the end all be all of solutions forever, but it works well enough when other options are just not options. The future is likely to be very different as AudioBus appears to be on the visible horizon. A far better way to get things done while still not needing any other gear or connectivity. Of course that depends heavily on developer cooperation. 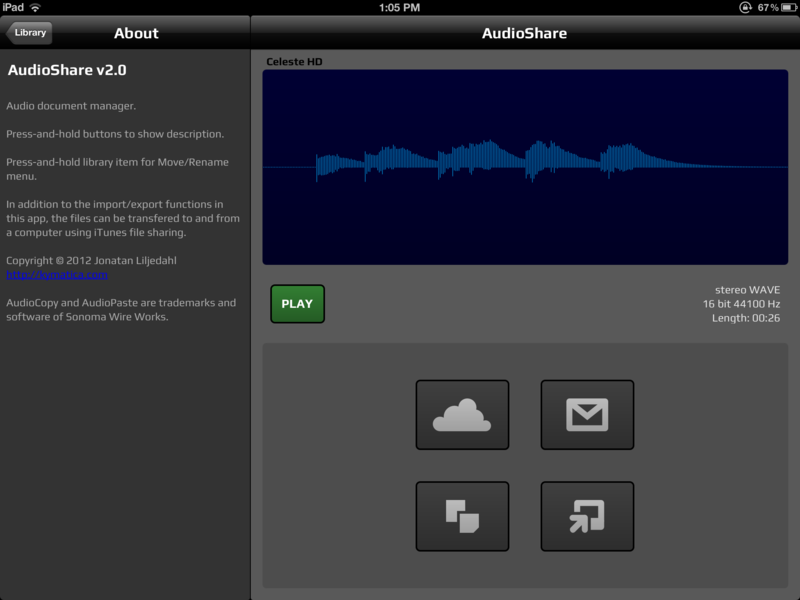 All your apps need to be compatible using AudioBus without problems. I am very optimistic about that not being a problem. While I’m not a techy guy fully understanding it’s technical specifications, I do understand its importance. Frankly I don’t care about the tech aspects, I just care that it works well preserving audio quality. I’m just an artist using the tech, not a developer making it. I trust the developers to get it right and cooperate. Failing to do so would be tragic. So that’s why, Audio Copy, at least for now. It’s flawed, but does the job when there are no other options. It fills a void that until AudioBus arrives fills it alone. 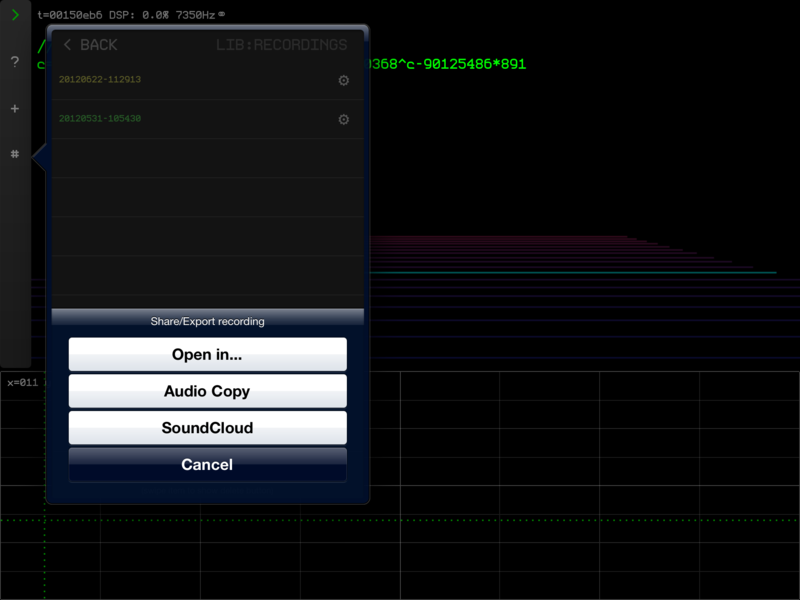 Music applications that neglect to offer Audio Copy are just not getting this point of view that defines true mobility. They are still good apps, but when I’m on a trail, in the forest, in the middle of nowhere, how am I supposed to use them? I cant. I dont. The trees don’t have outlets or Internet routers. It’s not a personal thing, it’s just about seeing things without placing obstacles in the way of the users. I honestly do not understand why any music app developer would purposely ignore the fact that their definition of mobility is not universal. It’s not just about a few places the developer thinks you can go, it’s about all the places anyone would like to go. It’s about offering people the option to enjoy their music apps fully wherever they go. Its like an MP3 player without a headphone jack. Sure you can plug it in to a stereo or something, but you can’t use it on a hike, or visit to a park because the developer doesn’t like headphones and thinks you should only use it plugged in with speakers. Yes, speakers are better, but that’s not a realistic option if you want to enjoy it anywhere. Well, that’s my point of view on the topic. Audio Copy has its uses, and works when no other options are available to do the job. Mobility, Freedom, Choice. That’s what makes iOS music great. All users have a different idea of what mobility means to them. None right, none wrong, all equally important. I would never say that a person who doesn’t use these things as I do are not mobile. Not at all. I’m only suggesting that for my uses in some circumstances it’s nice to have the option to perform a task. I can’t wait for AudioBus. Fingers crossed. I’ll be happy to never mention Audio Copy again. 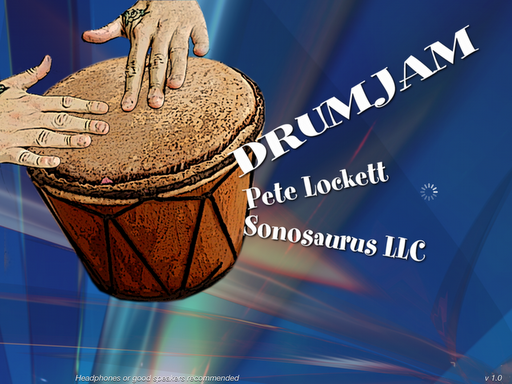 Sonosaurus, maker of the incredible ThumbJam, teamed up with award winning percussionist Pete Lockett to create DrumJam. 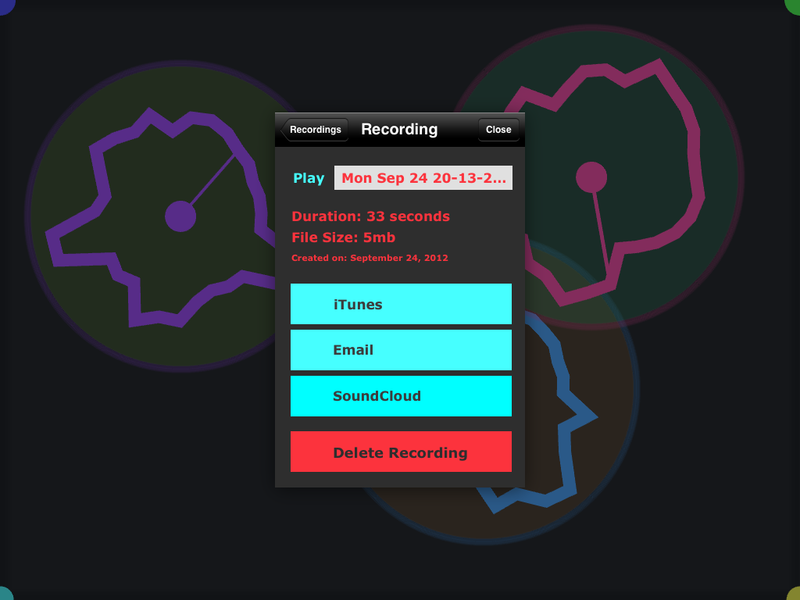 A truly accessible drum and percussion application smothered in brilliance. We all know about ThumbJam and how great it is. 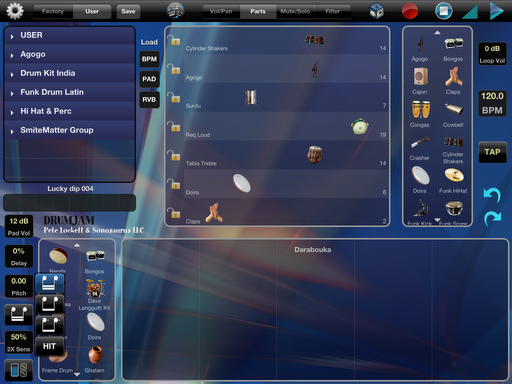 You can safely expect the same excellence of DrumJam in a familiar, and clever user interface. It’s easy to feel comfortable with live performance, there is no jumping from one screen to the next interrupting the flow of your jam. 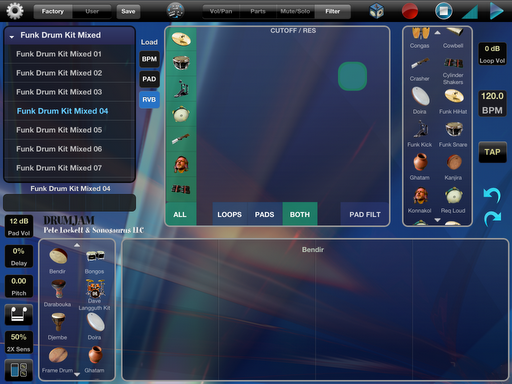 DrumJam has dozens of looped percussion instruments & drum kits to easily select by drag and drop to create multiple layers of varied rhythmic sound types. With an x/y pad type controller it allows full manipulation of individual instruments. Pan, volume, mute, solo, filter and are all easily controlled here. Each instrument has up to 20 different patterns recorded by Pete Lockett himself, and are also controlled by this pad. With multi tempo loop recordings over a wide range of tempos, all can be changed easily without messing up the rhythm thanks to the time stretch function. Reverb and Delay can be enabled by the touch of a virtual button. Each looped instrument can be locked to prevent accidental pattern changes. If you just can’t decide what to do, hit the randomizer for something totally unexpected. 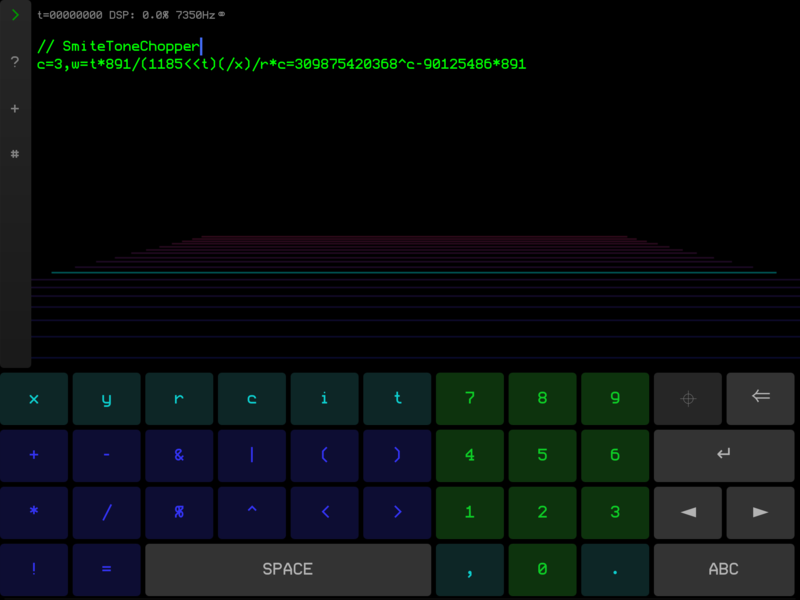 The randomizer can also be timed to change on its own periodically. It simply flows like a comfortable stream of uninterrupted jamming jubilation. For more on all the features of DrumJam click HERE to visit Sonosaurus LLCs website. The lower x/y pad allows control of the many solo instruments for you to play over the looped patterns or completely alone. 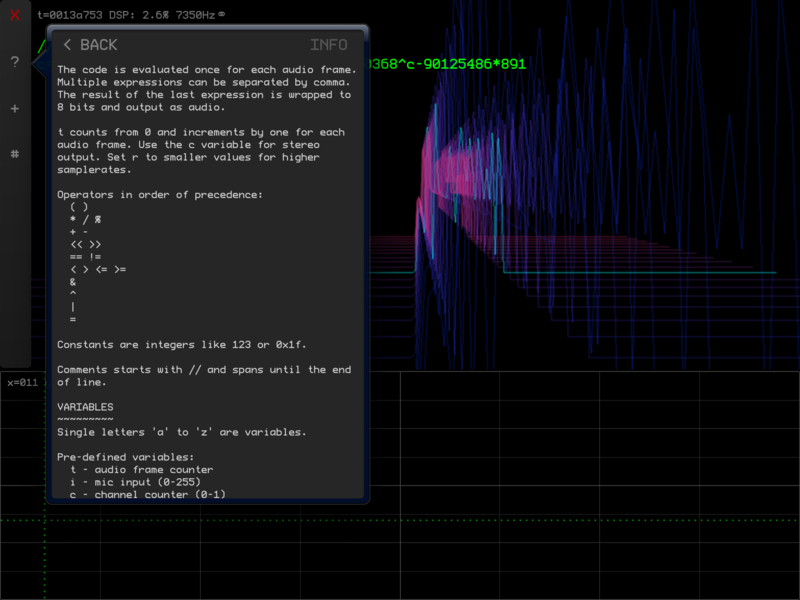 Instruments here are placed in the same drag and drop way. It’s all designed very consistently. With sensitivity control, and a full range of quantize, sounding great has never been so easy or fun. The solo pad can have FX applied including Reverb, Delay, Pitch bend, LoFi, and Distortion. Go ahead crush it! sound fantastic. Whether its a short beat or entire performance, all can be recorded at studio quality 44.1 kHz, 16 bit .wav and shared via multiple options. 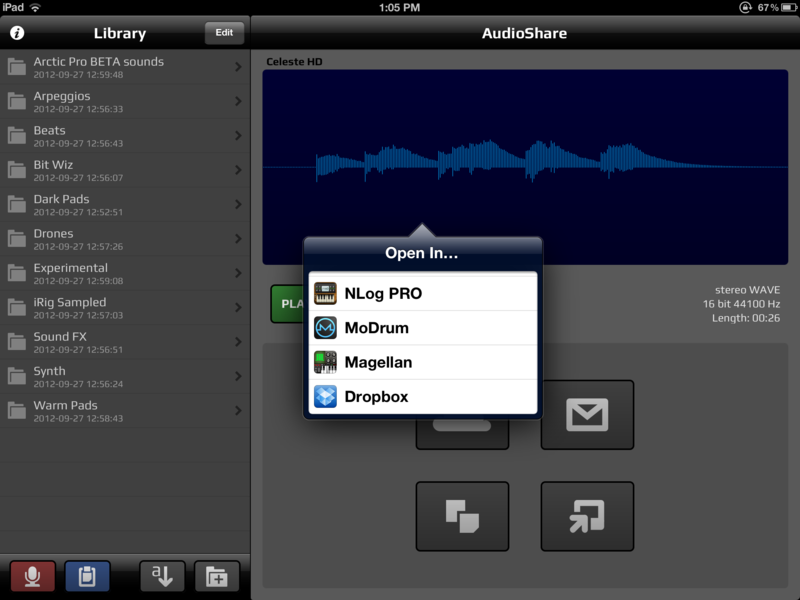 Sharing options include, audio copy, “Open In”, iTunes file share, and export to SoundCloud. 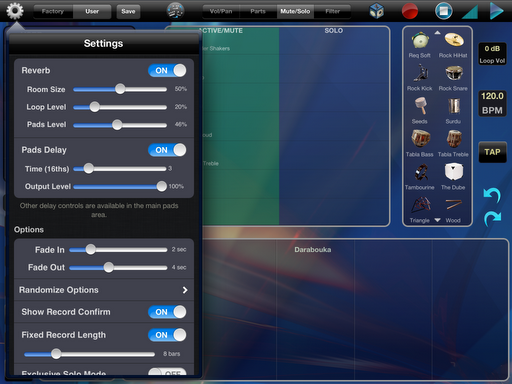 DrumJam is packed with a comprehensive menu of MIDI control options that support clock sync in or out. 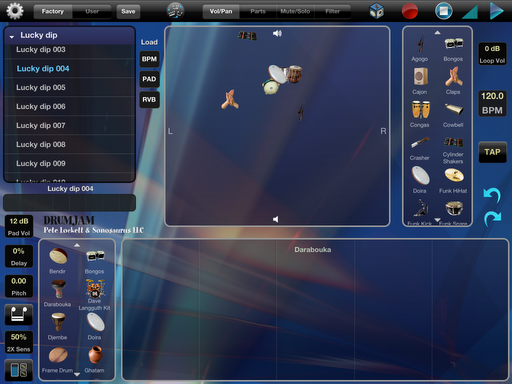 Virtual MIDI, and Background audio with a power save feature is included. I’ve spent several hours lost in DrumJam exploring and enjoying everything it offers. I can attest to the fact that even a novice rhythm maker can have a joyous experience sounding like a pro. With all the tools necessary and quality of DrumJam all around I’m sure a pro would be hard pressed to argue the greatness of this highly inspiring application. I just don’t have any complaints. Thanks to the excellent reputation of its developer there’s no reason to think further development isn’t in the future pipeline. Some of the things I was able to confirm with Sonosaurus which are in that pipeline follow. The additional content may be a mix of factory-included and in-app purchases. That’s strait from the source. These days music apps are more than tools. Yes they are increasingly capable, but they also offer a way for everyone to enjoy them to their fullest. Randomize a fun experience, create original parts for a composition, practice, teach or learn with it. Its all there. DrumJam is at the top of the iOS music heap among some very good company and should be on all music lovers iDevices.